Power cutting tools are an essential part of construction in our country. Without cutting tools, we would not be able to build 1/10 of what we build today. Cutting Tools encompass different specialties in their design. Band saws are particularly useful for cutting irregular or curved shapes. Chop saws are very common for doing trim inside a home. 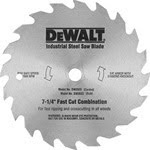 Circular saws are best for cutting long pieces of plywood and being mobile. And let's not forget about the jigsaw, which can get into places not many other saws can. Most contractors favorite is the reciprocating saw which is used to cut all kinds of things on a building site including bolts.